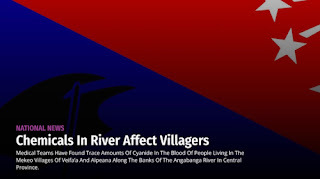 Medical teams in Papua New Guinea have found trace amounts of cyanide in the blood of people living in the Mekeo villages of Veifa’a and Aipeana along the banks of the Angabanga River in Central Province, PNG. According to councillor of Veifa’a ward two, Ben Afaisa, medical teams from Port Moresby had done an awareness on the effects, if any of the upstream Tolokuma Gold Mine in Veifa’a and other villages along the river, and had been approached by villagers who became sick after washing in the river. Upon a return trip to the villages, doctors discovered that villagers had traces of cyanide in their blood which could have been absorbed through the skin or through consumption of plants and animals that also inhabit the area. “We were tested by doctors from Port Moresby, and they found out that in our bodies we have cyanide and other harmful chemicals,” Cr Afaisa said. Efforts to approach the Central governor with their concerns have been unsuccessful, and villagers are hoping that the new government will be able to address the issue. “We haven’t heard anything from the governor about how they plan to address the issue. That river feeds all the west Mekeo villages along its banks, up till Bereina which is at the mouth of the river,” Cr Afaisa said.